We offer a selection of Personal Protective Equipment to maximise operator safety which is one of our main priorities. Our hard earned reputation as a supplier of quality safety equipment has been achieved by supplying safety equipment that enhances Productivity, advanced comfort and functionality while complying with all industry standards such as CE and NIOSH. We consider your safety a priority and our sales team will ensure that you get the correct safety equipment that won’t let you down. 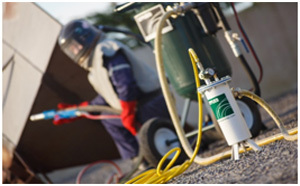 We offer top of the range hosing and fittings for the air fed helmets. 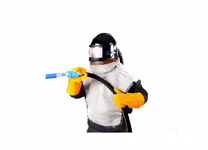 Our Teflon lined respirator airline hose connects the breathing air supply from the respirator airline filter assembly to the air fed helmet maximising comfort and productivity of the operator. The airline filters are designed to reduce odours, oil and water mist from the compressed air stream with manual moisture drains fitted. Heat generated by the compressor, an Air Cooling Controller & Air Flow Controller will allow the operator to fully modify the incoming air temperature. 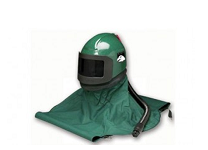 We offer replacement visors for a number of breathing air helmets. All our compressed air hose and fittings comply with the industry standard and requirements. 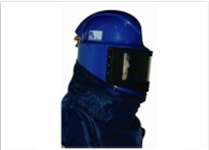 This breathable, lightweight and comfortable to wear hood can be used for mild abrasive blasting, grinding., polishing and other applications. The Applied Spartan Sand Blasting Helmet combines a breakthrough protection technology with advanced comfort and functionality. The Titan II SAR Helmet Air Respirator Helmet is the latest and greatest generation of the blasting helmets and exceeds the European CE standards. 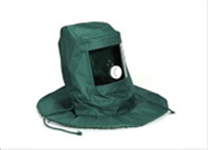 At Applied we supply a selection of replacement helmet visors for a range of sand blasting helmets. 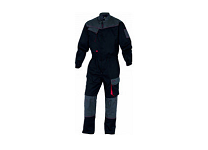 Applied blast suits are available in 3 sizes and are made from a polyester and cotton mix to offer comfort and protection. 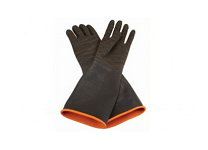 Our one-size-fits-all heavy duty sand blasting gloves give you protection and full control whilst blasting.